“What I really want is to spend my cruise feeling terrible” – said no one ever. You want to feel your best and enjoy every minute of your cruise vacation. We get it. No one wants to feel anxious about getting sick or battling motion sickness symptoms while they should be having the time of their lives. Seasickness is a problem affecting many people, with some having a higher threshold than others. Some people find their “sea legs” in a day or two, while others may never feel a thing. Seasickness (otherwise known as motion sickness or vertigo) disrupts your sense of balance and equilibrium. Your brain receives conflicting messages about the unfamiliar motion of the ship from your inner ear, eyes, skin and muscles. More than just nausea, seasickness can also manifest as a headache, fatigue, sweating and dizziness with or without a queasy feeling. If you’ve experienced this condition, you know how miserable it can be. Motion can also vary from ship to ship, meaning the feeling of seasickness you may have in a small or medium-sized boat doesn’t necessarily mean you will have problems on a large cruise ship. In fact, the larger the ship, the less it will rock. The good news is newer, modern cruise ships are equipped with stabilizers that reduce much of the motion that causes seasickness. The problem is real. 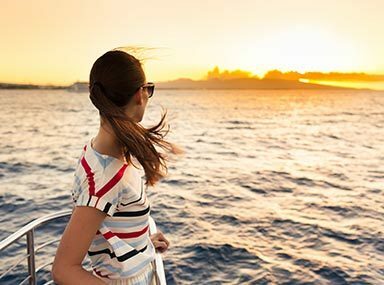 Let’s review some quick tips that can help prevent – or at least minimize – seasickness on your next cruise. What you do – from advance planning to the first day on the ship – is crucial to help your body get acclimated. If it’s your first cruise and you’re worried about seasickness, look for newer and larger cruise ships that may travel calmer seas. Alaskan and Caribbean cruises (outside of hurricane season) typically have calmer waters. You may want to choose an itinerary that has you docked on land more than out cruising on the water. Make reservations for a cabin in the middle of the ship near the waterline or a cabin on the outside with a window. When on board, go up on deck as often as possible to get some fresh air. Look out on the horizon, allowing it to act as a true point of reference and stability. Get plenty of rest, as being overtired can make you more prone to seasickness. Remember to keep something in your stomach even if you don’t feel like eating. Look out over the forward part of the ship, as it may help you to get acclimated to the motion and train your brain to stop the symptoms. Drinking a lot of alcohol. Before travel, avoid it altogether. It speeds up dehydration and lowers your resistance to seasickness. Eating spicy, acidic and fatty foods, especially a few days before you embark. If you struggle while on board, avoid these foods during your cruise. Looking through binoculars for a long time. Staring at objects for an extended time, such as books, magazines and digital screens. Staying below deck for long periods. Hanging out with others who have motion sickness symptoms. Believe it or not, the power of suggestion can take its toll on you. Try to focus on staying active with fun activities and put the stress of past experiences out of your mind. There are a variety of options to help prevent or alleviate seasickness symptoms. The key to prevention is planning ahead. Remember to pack whatever seasickness prevention remedies may work for you. Seasickness remedies will differ from person to person. If you know for a fact you are prone to motion sickness, make talking to your doctor a priority. Always check with your doctor to be sure any over-the-counter and prescription drug products will not conflict with any current medication you may be taking. Certain medications, medical conditions and even hormones can trigger seasickness, so talk with your doctor about these as well. Antihistamines are commonly used to prevent and treat motion sickness, and work better if you start taking them the day before you embark to allow your body to get used to it. This would include meclizine (Antivert®, Bonine®), dimenhydrinate (Dramamine®) and diphenhydramine (Benadryl®). Side effects? Drowsiness. A prescription option may include Scopolamine oral pills or the ever-popular skin patch (Transderm Scop®). The patch, applied at least eight hours before exposure, can help prevent motion sickness for up to three days per patch. Side effects? Dry mouth, blurry vision and drowsiness. Aromatherapy with ginger, peppermint or lavender. Real ginger and/or peppermint capsules, powder, candy, gum or tea. Some suggest taking it within a half hour of embarking and each morning of the cruise, along with plenty of water. Acupressure wristbands, such as the Sea-Band. These work best if placed on both wrists before getting on the cruise ship. Some claim eating green apples, sipping on ginger ale, chewing fresh ginger and nibbling on crackers can help alleviate nausea. The motion of the ocean doesn’t have to mean seasickness on your cruise vacation. With our tips, you can help prevent seasickness on a cruise. If you do get sick however, there is always a nurse and medical staff on board to assist you. Having cruise insurance can help. Now go, explore the world one port at a time! We hope you enjoy every minute of it. Subscribe to the Smart Travels Newsletter to learn more about traveling easier, safer and smarter. This site contains a brief description of benefits. Refer to the applicable Description of Coverage (DOC) for a summary of plan details. Certain conditions, exclusions and limitations apply. If there is any conflict between the contents of this website and the DOC, the plan details will govern in all cases. *Assistance Services mentioned are provided by Travelex's designated provider and are not underwritten benefits.